Change is afoot at Fleetwood Town but before he looks ahead to next season centre-half Cian Bolger wants to send departing boss John Sheridan off with three points. Sheridan has steered Town to League One safety since taking over from Uwe Rosler three months ago. 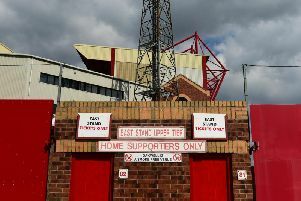 But Fleetwood have lost their last three and Bolger wants a return to winning ways when they host Walsall tomorrow to give Sheridan the send-off he deserves. The ex-Oldham boss’ short-term contract ends when the curtain closes on this season, with controversial Joey Barton set to take the reins when his ban from football ends in four weeks. Last term Uwe Rosler guided Town to the play-offs. A defeat by Bradford ended their promotion quest, which Rosler’s men could not emulate this season and a seven-match losing spree saw chairman Andy Pilley change his head coach. Bolger wants to end a disappointing season with a win but believes Walsall, who also secured their League One status by drawing with Bradford on Tuesday, will be a tough test. He said: “Coming off the back of last year, it has been a little bit frustrating but now we are looking at Saturday and ending on a high. “Walsall are a good team and a lot of pressure has been taken off them. They have some good individual players who pose a threat and we have to be ready, play our game and hopefully get the win. Both teams have little but pride to play for but Bolger says that will not change his preparation for tomorrow’s game or his desire for victory.